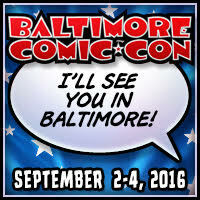 Here's my panel schedule for this weekend's Baltimore Comic Con. The rest of the time I'll be at my table signing books. If you're at the convention, please come by and say hello! I've really got to ask what you were thinking regarding music influence- just guessing it had a LOT to do with the Beatles! One good thing about questions inspired by these seminars: it's fresh on your mind! But the beautifully-Celtic-sounding Myrwann, Augusta Wind, Savior 28,Joshua Rose, even Ben Reilly all beckon too- and I offered to keep the whole thing to 15 questions and used 9 of them. Feels like I have a magic lamp, but don't want to annoy the djinn! I hope you came away with few 'Con germs, had a great time in Baltimore- and happy Star Trek anniversary, J-Marc! M.C. J-Marc: your hip hop handle- if that's your after dinner cup of tea! Of course there were MANY others, but that is the top of the list. I think I'll tap into the wealth of interviews you've given to take the questions further afield; between your podcast about your IDW work and the Spider-Panel at Terrificon, there's more profile material than you can shake a web at! AT least we're about to dig on your musical venture. It's nothing short of amazing: few writers of your freshman era are still published as widely (I can think of, at present, none, going so far back as '78 to present), much less monthly. Your gratitude really shines. I'm tellin' ya, there's a decent-sized biography here to write. It's formative to a relative ingenue such as myself. I don't know how interesting that biography would be! Thanks, Cecil. That song is very short, a gentle (but totally heartfelt) tease leading you to the rest of the album. Enjoy! I just played "Santification" for Angela Dawn. About :45 seconds in, she's impressed, and over the next twenty seconds she just blurts out: "Damn, he's got a good voice!" I listened to several songs Saturday and noted you use several vocal approaches or "voices": you have really got the goods, J.Marc! The lyrics were thoughtful, as well: I made sure I had no distractions, except for, uhm, some of your JLI I hadn't read in so long. Peeked at them, too. I look forward to wherever else the songs will go musically, but there's real talent, and not just one restrained songwriter's voice, but a love of melody! Take it from one who has known the joy of such things, I mean it sincerely. Between you and my discovery of Alice Cooper, and us feeling healthy, there may be a full revival of Integr8d Soul's songs. How one makes peace between making music and writing or drawing- fitting them into a life that doesn't shut others out too harshly- was an early thought I had for your questions. Afua Richardson was still singing while drawing for Marvel to this year- I see how naturally it comes to some, that they must make songs as well as write, perhaps even paint or draw. It's all a matter of time! And I got the impression you'd say, "just listen for wherever the gifts resonate. Make what's asking to be made, and don't worry for yourself!" So glad you're enjoying the CD, Cecil. I'm as proud of that as any creative work I've ever done; and making it was one of the single greatest joys of my creative life. Years have gone by since "How Many Lifetimes?" came out, but I'm still hoping to go into the studio and record more songs. And this time it'll have to be a double album!